Highlighting our Scottish research during Tartan Week at GCNYC. Researchers from the Yunus Centre for Social Business and Health discussed how banking can be a force for good in an event to promote a US-UK collaborative research initiative, entitled Money, Debt and Public Health with Professor Cam Donaldson, Professor Pamela Gillies and Dr Olga Biosca along with Jonathan Morduch from New York University. The politican in charge of Scotland’s finances will outline the importance of the Sustainable Development Goals at GCU’s annual research celebration in May. Derek Mackay MSP, Cabinet Secretary for Finance and the Constitution, will be the keynote speaker at the event, to be held in the University’s Hamish Wood building on Friday, May 31. GCU’s research strategy is underpinned by the Sustainable Development Goals, issued by United Nations in 2015 and developed in order to “end poverty, ensure prosperity for all and protect the planet”. Through our own research, GCU addresses the Sustainable Development Goals via three societal challenges of Inclusive Societies, Healthy Lives and Sustainable Environments. This work will be exhibited throughout the day via various workshops and activities, rounded off by GCU’s annual Three-Minute Thesis competition. Workshops include Solving water issues in Nigeria, Electrical stimulation to promote health in adults, and much, much more. Last year’s event was a great success with over 200 people attending. First Minister Nicola Sturgeon took part in an experiment to measure the speed of a cricket ball at our Meet the Researcher event, held in the Gorbals. This offered school pupils the chance to meet university researchers, and learn about science and further university-community links in pursuit of the SDGs, which apply to all countries of the world and are in place until 2030. 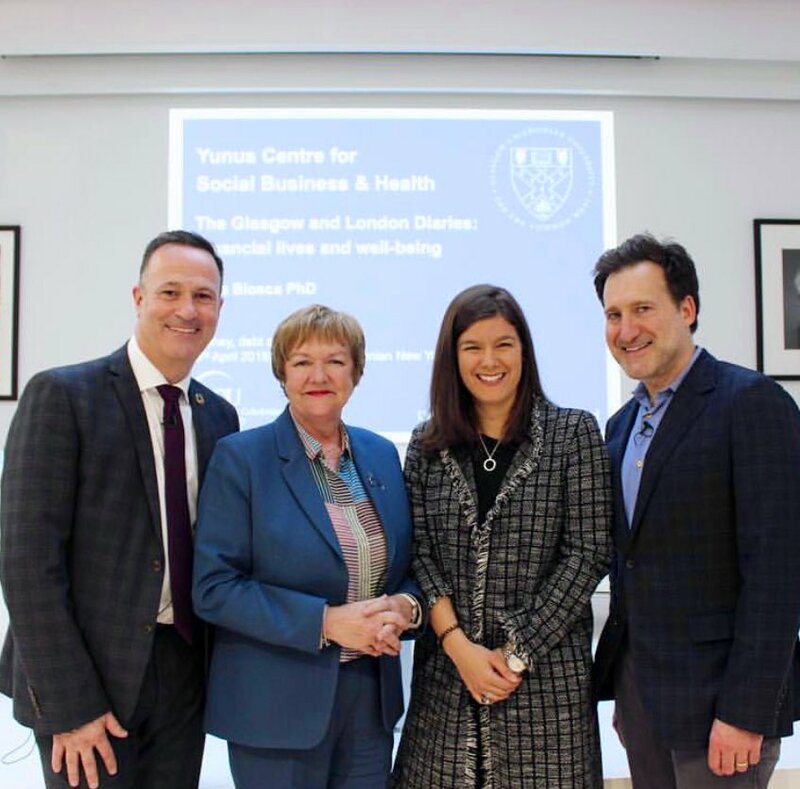 A new research project is under way at GCU London, investigating the financial lives of people with long-term health conditions and low incomes. Led by Dr Olga Biosca, working with Profs Rachel Baker, Cam Donaldson and Antony Morgan and Dr Neil McHugh, the project is funded by Guys and St Thomas’ Charity for one year. The aim of the project is to establish whether there is a link between people’s financial lives (including the use of microcredit initiatives) and their health (focusing on co-morbidities), and the mechanisms that facilitate this association. This builds on a previous study in Glasgow, “Finwell“, funded by the Chief Scientist Office and completed in 2017. Three new researchers have been appointed at GCU London: Dr Ahalya Bala, Dr Greg White and Marta Mojarrieta. They will generate quantitative and qualitative data using financial diaries, qualitative interviews and Q methodology. A Professor from GCU has been offered a prestigious Fellowship from a research institute based at Princeton University. Professor Michael Roy, who holds a joint appointment at the Yunus Centre for Social Business and Health and Glasgow School for Business and Society, will spend a semester at The Center of Theological Inquiry (CTI), in New Jersey, from January 2020. CTI’s model, based on the world-famous Institute for Advanced Study, brings together academics from around the world to provoke dialogue between the humanities and social sciences on issues of global concern. During his time in the US, Professor Roy plans to build upon his previous work, and that of colleagues, on the role that social enterprises play in tackling poverty and inequality. Professor Roy will work on his research project entitled Economic Organising for the Common Good? Karl Polanyi, Catholic Social Thought and the Grand Challenge of Economic Inequality, at CTI. He said: “I am absolutely delighted to have been awarded this Fellowship. “The process was really involved and competitive. The proposal I submitted is designed to draw upon the theoretical and philosophical thinking for which scholarship at CTI is globally renowned. Professor Cam Donaldson, Pro-Vice Chancellor and Vice-Principal (Research), said: “The award of this Fellowship from an Ivy League university is a great honour and represents the stature now attributed to Michael’s work, as well as recognising the international reputation of our Yunus Centre for Social Business and Health. Last year, Professor Roy won the coveted Helen Potter Award from the Association for Social Economics, also based in the United States, for his social enterprise research. The annual prize recognises outstanding work that challenges mainstream economic thinking. It is presented to the author of the best article in the academic journal Review of Social Economy.